I've been having a look around and every where I look seems to have different accessories on the same figures. Was the snap cape only released with the moulded TAIWAN? I have 3 cape variants, can any one tell me what go with what figures? one snap cape(brown), one the same color and the last is a lighter brown? Where all the color blasters released with all the figures? I have a light brown/green and a Dark grey? I've had a look on there thanks mate, but cant make out the accessories compared to the ones I have. I was thinking the same Paul, Craig provided a lot of information on Luke Jedi accessories on this forum. Hi guys here's an update for the Luke Jedi capes. I have scored a complete MIHK Luke with the correct cape and confirmed it with MOC examples. It not only darker but also fluffier. I mistakenly thought a big ribbed cape was the MIHK cape as it was slightly darker. This is not true the big ribbed caped seem to belong to the HK COO lukes only. I'm a little rusty on my loose accessories where I've been focusing more on MOC, but from my limited experience with the loose variations your Tan blaster should go with the Hong Kong COOs. The snap cape on the other hand can come from either COO. It was originally thought to have been only early Taiwan figures like the moulded Luke, but a few years ago I picked up a MOC 65a blue saber Hong Kong figure in which you can clearly see the snap in the bubble. Hopefully Craig can chime in at some point here too as he has quite a few loose variations and has been tracking that info. I could only see one Luke cape on your limelight. That one is from a figure that has "Made in Taiwan" stamped on his leg... so will go with the figure on show. I can't see the weapons clearly in your photo but if you can send me I hi-res photos I will double check them for you. 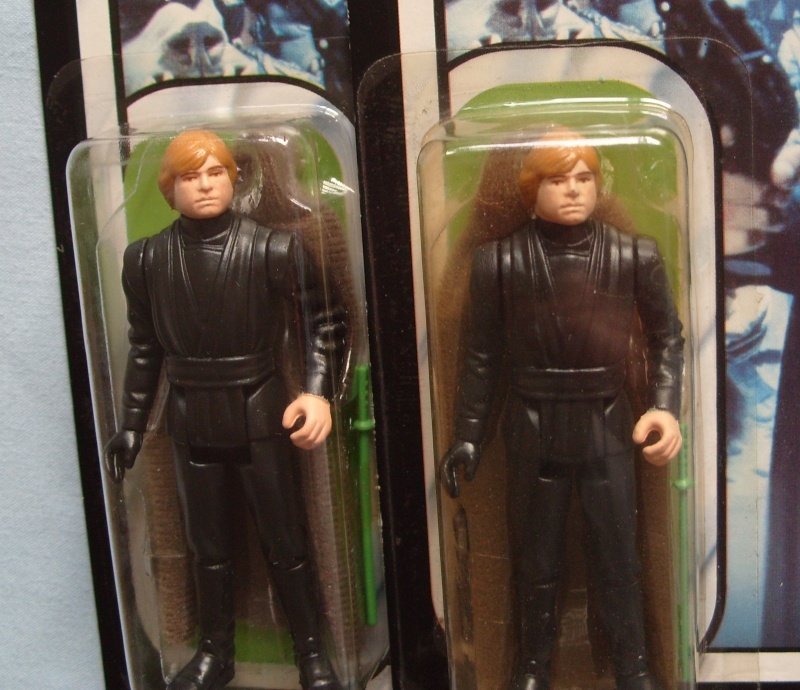 Note: you can get BOTH Tan and Grey palace blasters for a "Made in Taiwan" Luke Jedi. So the Tan Blaster is not necessarilywrong for this figure! COO: "Made in Hong Kong"
Thanks for the offer of checking out the pic for me Craig but my cameras shite mate. I only have the one cape in my limelite at the moment and thats the tan blaster with it. Did the HONG KONG also come with the grey blasters or am I better off swapping them around? You say the Snap Cape was produced by all 3 Major Factories, are the colors the same as in Dr Dengars post or was it only the one color? you said in my post that the Snap Cape was produced by all 3 Major Factories, are the colors the same as in Dr Dengars post or was it only produced in the one color? Thanks for your PM as I did not check the thread and see that you asked me a question or two. I replied here so anyone who is interested in the future can see what my reply was. Short Answer: I believe there should be 3 different Capes. I don't have all three snap capes loose at this stage of time to be able to give you another comparison picture with snap capes sorry. Here's the photo I took for Marco (Dr Dengar) again. Here, I used only stitched capes because I didn’t have snap capes for each factory. However, if you do look at my photo you can see the colours and texture are different for each cape. Since each factory made their own accessories, I expect all three snap capes to be different and the material to follow the same texture and colours as in my photo above. The reasons for this could be as simple as the factory reordering a new batch of cape material and accidently ordering the wrong material order number or the supplier simply “improved” the quality of it material changing the texture as a result. I don’t know yet. At the moment I still expect the above original research to be true for the snap capes as they had a very short run life and so there should only be 3 different capes and only one type for each factory. I just want to make this clear in case I find more evidence that contradicts my original findings. This is 100% guaranteed as the cape is still factory sealed inside the bubble. As the MOC is in my possession, I can confirm the MOC hasn’t been tampered with (i.e. nobody has inserted a Snap Cape inside the card and resealed it). I am not sure if the photo is clear enough but the cape has the thinner banding. This is very much similar to the stiched version above with the green sleeve. Notice in earlier MOC versions of this figure, the people in the factory would actually hold in Luke and his cape inside the bubble by the green sleeve, which was taped to the inside of the bubble before mounting to the card. If you look at the above photo you can see the then green sleeve behind luke. This is pretty solid evidence that the same textile dept. made the capes. I haven't looked at this photo in a while and didn't realease how fluffy the cape is... hmm this looks like the fluffy cape texture in the Palitoy photo above. 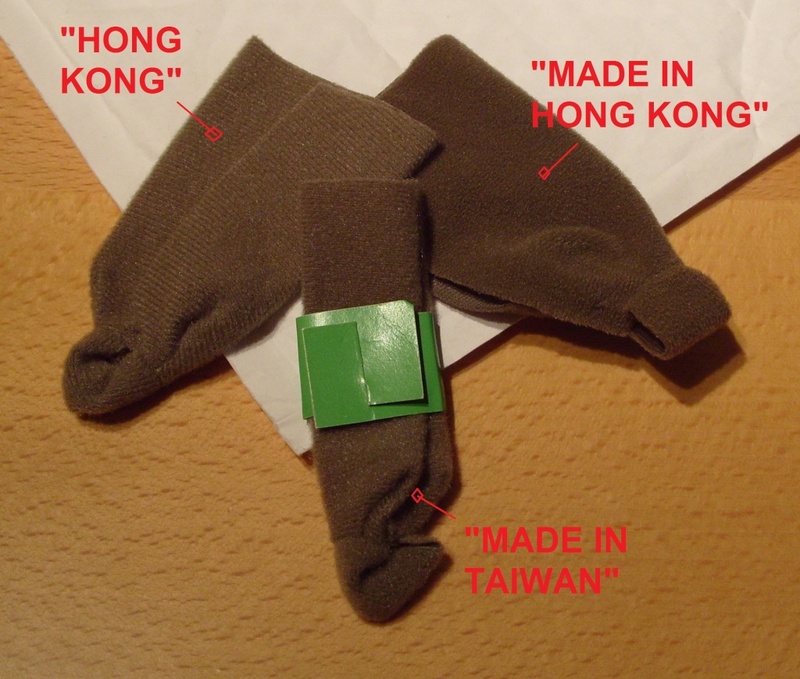 I am starting to wonder now if the "HN" factory used at least two different materials. Both Shawn and Tommie are highly respected and stellar MOC collectors with a lot of experience in collecting MOCs. So I would be more than happy to say that these are 100% legit specimens too. Back to you other question on the Palace blaster. I have not seen a grey palace blaster for the Hong Kong Jedi, but this doesn’t mean they don’t exist. Note there seem to be two "tan" colours for "Hong Kong"
I didn’t understand what you meant by swapping the blaster? To be accurate I would check your blaster against the reference guide photo here on TIG..
To be consistent you should match the gun mould with the correct Luke Jedi figure. At this stage I wouldn't worry about the matching the sub colour. It is the mould that is really important if you want to be truely consistent. Each factory made their own guns so as long as you match the mould you will be fine. Well I have to take my hat off to you for starting out on this variant collection so hopefully the information here will stand you in good sted! You can expect more updates on this if and when I find more. But for now, I hope this helps! Sorry for the long answer just wanted to wrap this up properly. BTW: You have new mail! First of all Craig, thanks for the great reply it really has been a great help, also for posting it on this thread so others can benefit from it. You dont have to explain your self mate and your entitled to find evidence that contradicts your original findings, as we wouldn't even have this information if it wasn't for original research, Thanks for sharing. That's a great tip on matching the gun to the mold and not the color, didnt think of that also a good tip for other characters not just Luke Jedi. What I meant by swapping the blaster was I have a tan blaster in my limelite with the TAIWAN fig and a grey one here. I was talking about giving the TAIWAN the grey one and my HONG KONG the tan, as you've all ready confirmed that the HONG KONG has a tan blaster, I will check out the mold now though.